CarbonX™ (Gen 2) CFR Carbon Fiber Reinforced Nylon Filament is a semi-aromatic polyamide copolymer reinforced with high-modulus carbon fiber. You will earn 74 loyalty points with this purchase worth £0.74 that you can use on this order. CarbonX™ (Gen 3) Carbon Fiber Reinforced Nylon Filament is a semi-aromatic polyamide copolymer reinforced with high-modulus carbon fiber. 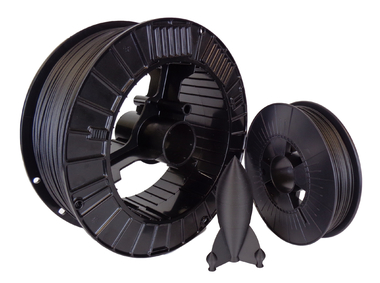 This filament is ideal for anyone that desires a structural component with high modulus, improved chemical and thermal resistance, excellent surface quality, and ease of printing. Tired of nylon that warps? This is the answer you've been looking for. Excellent dimensional stability comes from the carbon fiber and the semi-aromatic nylon. Why is it important that CarbonX™ (Gen 3) Nylon is a semi-aromatic polyamide? Semi-aromatic nylons have a large cyclical structure in its backbone which makes them stiffer, more chemically resistant, less moisture sensitive, and have improved dimensional stability vs. aliphatic nylons such as PA6, PA66, and PA12. New Data: We updated the mechanical and thermal data on our carbon fiber grades. You can see the new data HERE on our blog. Please note: Customers should test their parts to determine end-use suitability using this polymer. CarbonX™ (Gen 3) Nylon is suitable for use in practically any desktop 3D Printer that has a heated bed. Please note - carbon fiber reinforced filaments are abrasive and can wear out a brass or aluminum nozzle, it is recommended to use a hardened steel nozzle. Extruder: 240-270°C. CarbonX™ CFR Nylon exhibits improved layer bonding at higher temperatures. Drying - very important. This product is supplied dry and sealed in thick 4mil pouch with several packs of desiccant. However, it is made using nylon and will absorb more moisture than other resins when left exposed to the environment. Excessive moisture will result in popping at the nozzle (water boiling off, a little steam) and excessive drooling and nozzle build-up. Make sure to keep this filament in a dry location between uses. If the filament does get wet, you can dry it out with a basic toaster oven (not one for the family food!). We recommend drying it for 2-3 hours at 70-80°C. Caution: Make sure to check back often to make sure you're not distorting / melting the reel - the reel itself has lower thermal resistance than the nylon filament and will distort / melt before the nylon. Disclaimer (of course): This technical information is furnished without charge or obligation and accepted at the recipient’s sole risk. The information provided in this data corresponds to our knowledge on the subject at the date of its publication. This information may be subject to revision as new knowledge and experience becomes available. The data provided should not be used to establish specification limits or used alone as the basis of design; they are not intended to substitute for any testing you may need to conduct to determine for yourself the suitability of a specific material for your particular purposes. Since we cannot anticipate all variations in actual end-use conditions, 3DXTech makes no warranties and assumes no liability in connection with any use of this information.